There’s always a little bit of space that is left open after you finish a new room decoration and a lot of the time you just don’t know what to do with it. 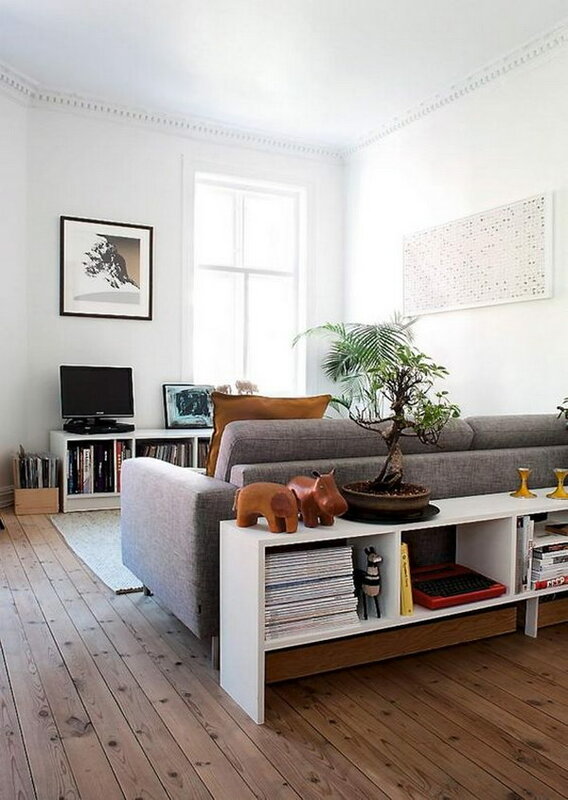 That is often the case with the area behind a sofa, either because it is scooted against a wall that is awkwardly blank otherwise or because the space is so small and/or narrow that nothing seems to fit there at all. Sometimes it is fine to leave that space as is, but other times you might want to make a better use of the space – especially if you don’t have that much to spare – or it simply just doesn’t look right, so you feel the need to fill it somehow. This article is full of ideas of how to make use of the space behind a couch which are both functional and aesthetically pleasing, so you don’t have to sacrifice space for aesthetics or decoration for function. Installing shelves on the wall behind the couch is a fantastic way to make use of the available space and provide a support for some decoration. 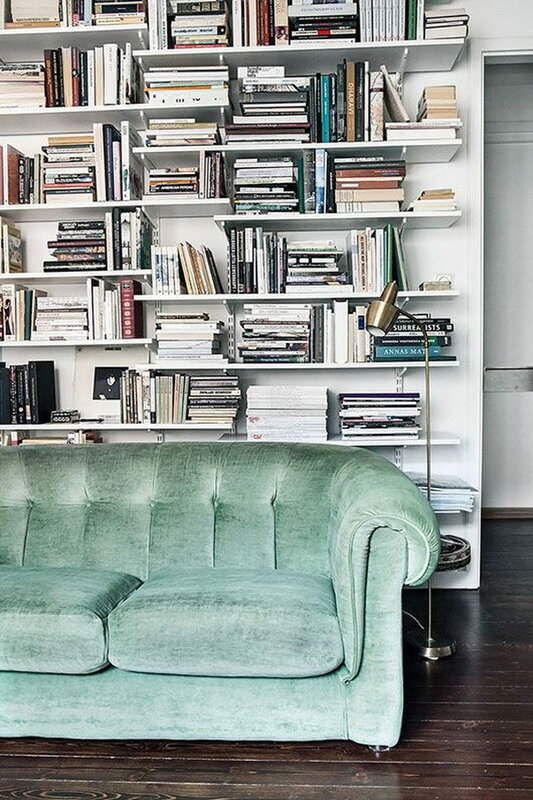 It is also a very cool idea for something like books because you can easily reach them on the lower shelves while lounging on the couch itself. via decoholic. 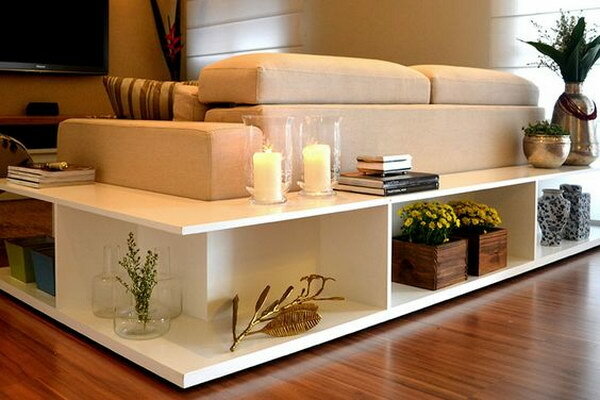 Another similar idea is to “sandwich” a very narrow table between the sofa and the wall, so you can set frames, candles, plants or lamps on it for decoration and function. via alwaysneverdone. This table, which is set at the sofa back’s level, is more of a floating style option. Again, space is quite limited, but you can easily use the console to have your essentials handy when you sit down. via jennasuedesign. This flower themed decoration is more in line with what people usually do to fill up space behind a sofa. 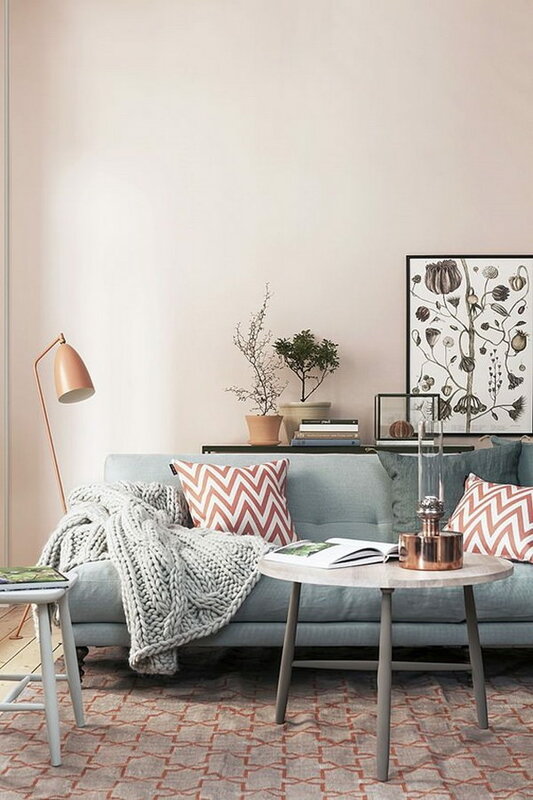 The frame and flower vase are the main pieces, but the stand lamp adds some functionality, as it provides light for some nightly reading on the couch. via minhacasaminhacara. This little DIY wooden table behind the sofa, which is very easy and accessible for everyone to make, is all about functionality. Its strategic placement, coupled with the outlets on the wall, allows you to charge your electronic gadgets while keeping them handy during rest hours. via turtlesandtails. The repurposed storage unit turned sofa console is actually a genius project, as you can prop and store things on top of it, inside and at the ends of the sofa. via cathygreeninteriors. 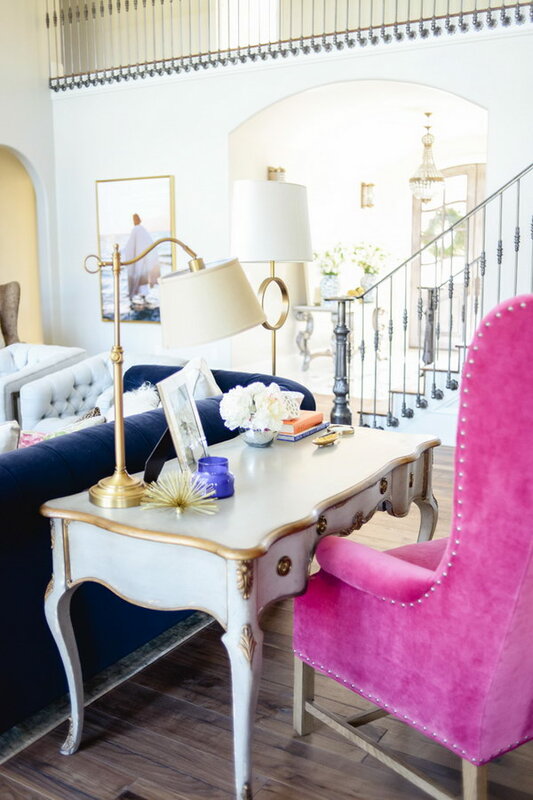 This beautifully decorative, vintage style desk takes the whole concept of maximizing the space in a decorative way to a whole new level when placed behind the sofa. via pinkpeonies. 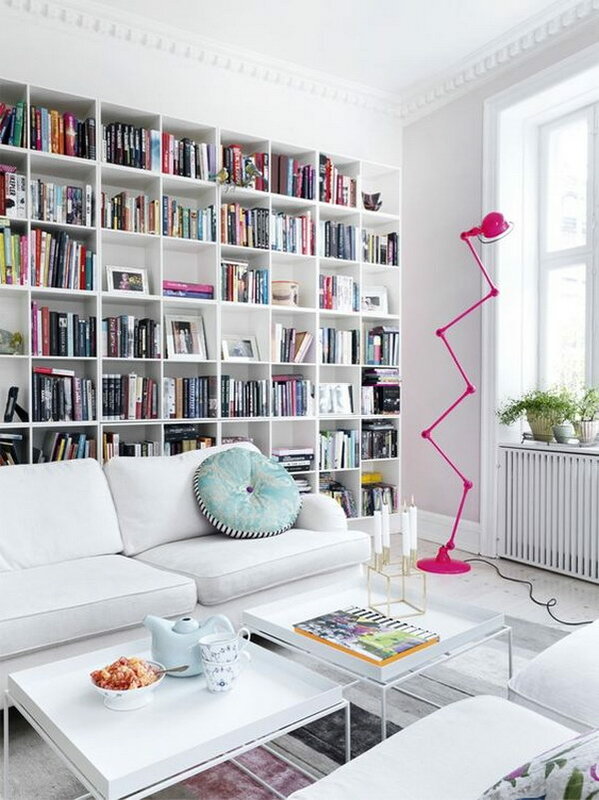 This is a great idea for those people who want their living rooms to feel like a library. 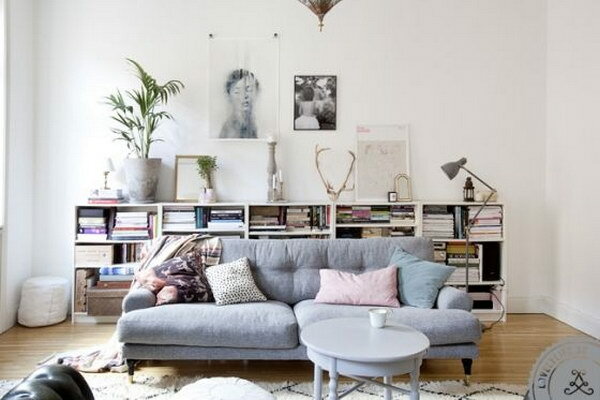 The small bookcase behind the couch creates a different structure but also allows you to have books and magazines nearby when the time comes to unwind. via apartmenttherapy. On the other hand, installing a storage unit like this one behind your sofa is a great option if you have things that need to be organized but not necessarily displayed or easily accessible. via theglitterguide. This dark, full length bookshelf with a framed picture in the center is a great contrasting background for the lighter gray couch. via huntedinterior. A floating bookshelf will always be the best option to frame and fill the space behind a sofa, as it provides a lot of often necessarily storage and decoration space and options. 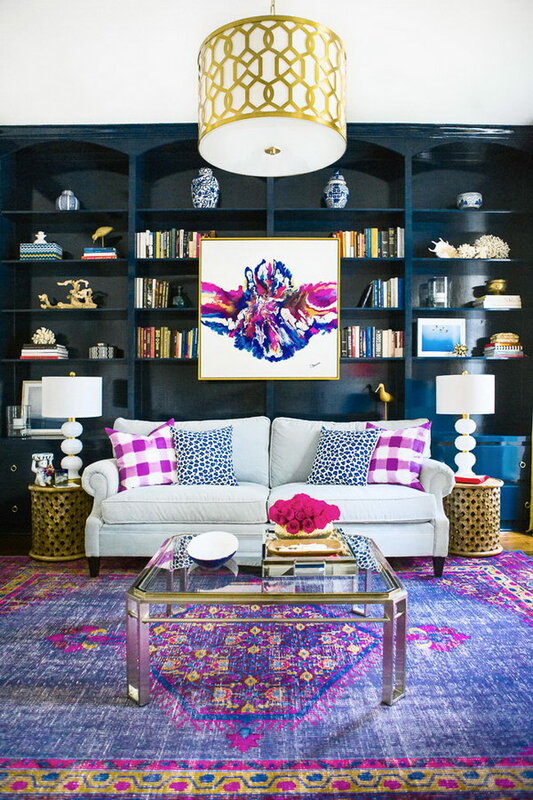 In this case, the irregular set of shelves matches the couch and the rest of the room beautifully, enhancing the place’s aesthetic without being overpowering. via style-files. 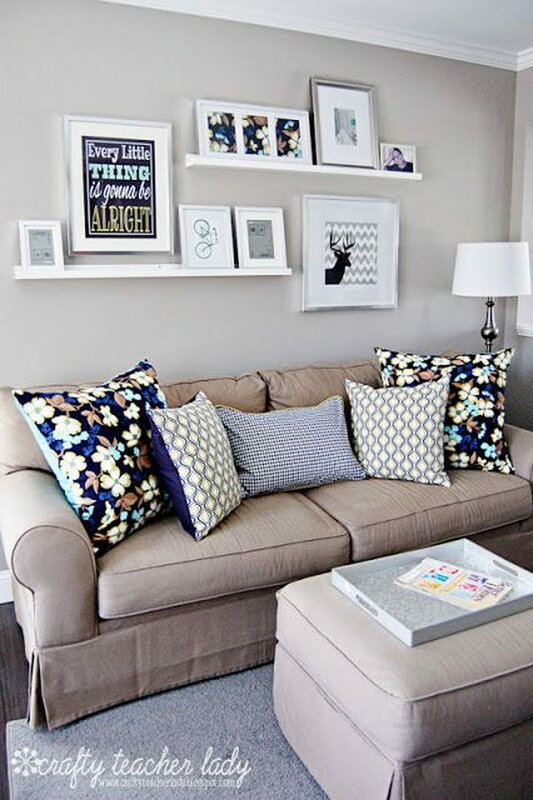 These white floating shelves are the base for the decorations behind the sofa in this living room, as they hold the various picture frames that contrast with the grayscale color scheme of the décor. via craftyteacherlady. The space behind the sofa was used for decoration in this room, as a mix of cream colored floating shelves, canvases and other decorative elements bring the neutral wall to life. via southernweddings. This is a perfect design for readers and students, as the small bookshelf with lamps on top and the sides makes for easy and comfortable reading sessions on the couch. via lovelylife. This small storage unit looks stunningly stylish behind the sofa both because of its unusual, clean lines and the way things are placed somewhat sporadically in and on it. The size of it is also perfect, as it provides subtle height and color contrasts. 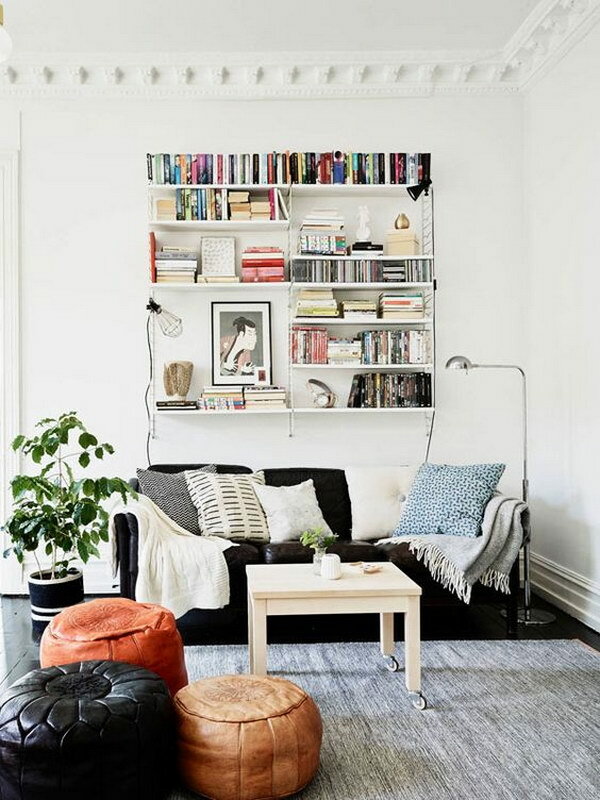 A wall of books can look quite overwhelming, but this white one is perfectly embedded on the wall and provides a great frame for the barely darker sofa with all of its squared compartments and the colors of their contents. via designattractor. This is a perfect example of how not to waste any space. The combination of the couch, frames and embedded ceiling shelves could have been somewhat overwhelming, but it works in this case because the shelves blend in perfectly with the wall while providing extra storage space that is especially needed in small rooms. via huffingtonpost. Yet another great example of why having a bookcase behind your sofa is one of your best options. 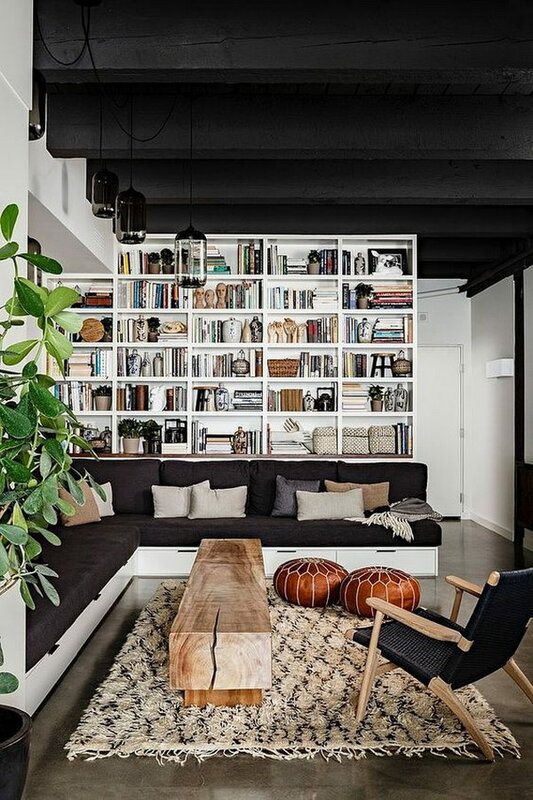 The white bookcase provides a great contrast to the black sofa and ceiling, and it also provides tons of storage, which is sometimes really needed. via homeadore. This beautiful built-in storage unit works perfectly against the otherwise gray hues of the room. It provides great storage without occupying too much space and looks very nice, which is all you could ever ask for. via brassandgold. This sofa table is yet another example of the beautiful and useful things that can be installed in smaller spaces. The woodgrain color amd texture looks really good against the cooler gray tones of the overall decoration and the unit is great as an office style storage space. via sarahmdorseydesigns. DIY bathroom mirror with slide out sides, great idea. The receptacle installed facing up in the table behind the sofa is a violation of the National Electrical Code since someone could drop water in it by accident and could potentially get electrocuted. It would be a good idea to have that picture removed since it may temp some people to do that installation. No more out of code than a power strip or an extension cord: which it is how it is being utilized. If the outlet is out of code, which it isn’t because it’s temporary wiring, then maybe suggest using a gfci. What gets me is that the master electrician did not notice that the wiring for the temporary outlet is not correct. Folks, if you do the outlet behind the couch please wire it correctly. you could JUST move the plug hole [outlet] to the end of the console. Amazing!! I always wonder where to put my coffee cup around the sofa. Definitely will start to try the wood one out! Or you can relocate the unit on the side of the console which would be safer.